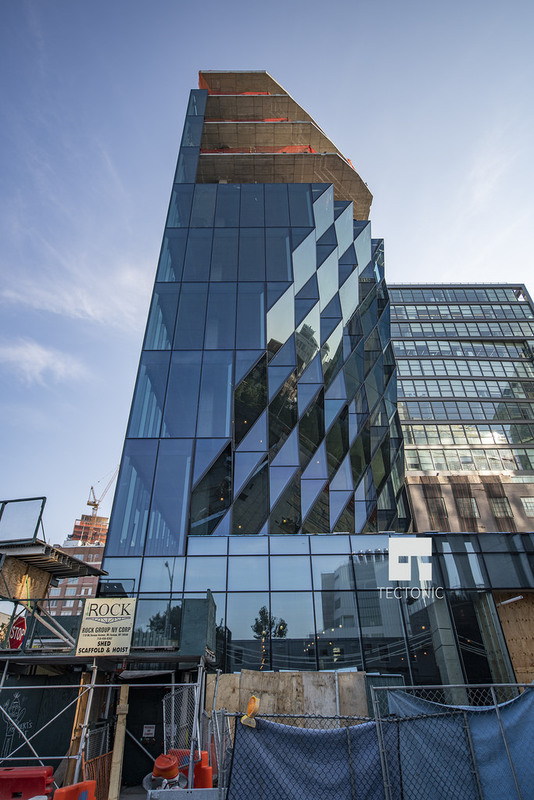 The latest progress photos from Tectonic show the curtain wall already makes a good first impression when walking north on the High Line, as the sun easily breaks through and shines upon the walkways and landscape. The intention of the designers was to ensure that enough light could penetrate and illuminate the High Line no matter the time of the day, or the building’s size. 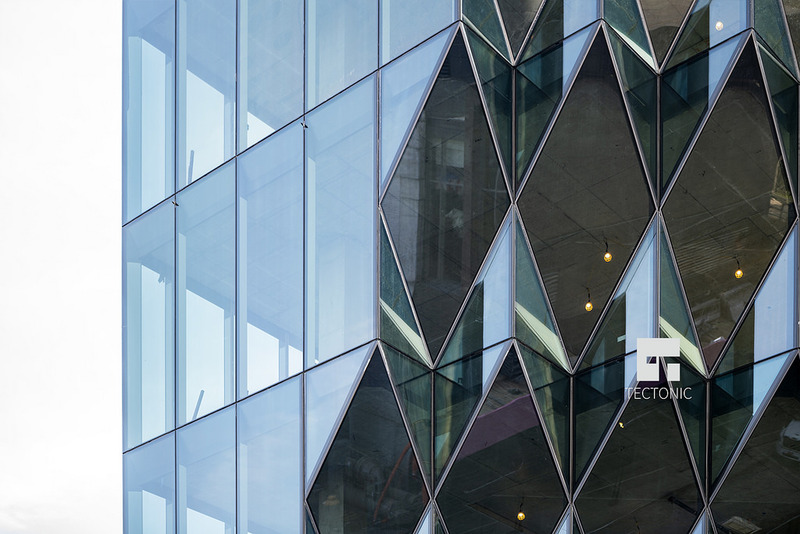 Thanks to careful solar orientation studies carried out by the designers, the bottom half of the building pulls inward, allowing light to shine on the office’s outdoor terrace and the street below. It then tapers back again at the top, to form a striking chiseled profile, giving the building its signature look. 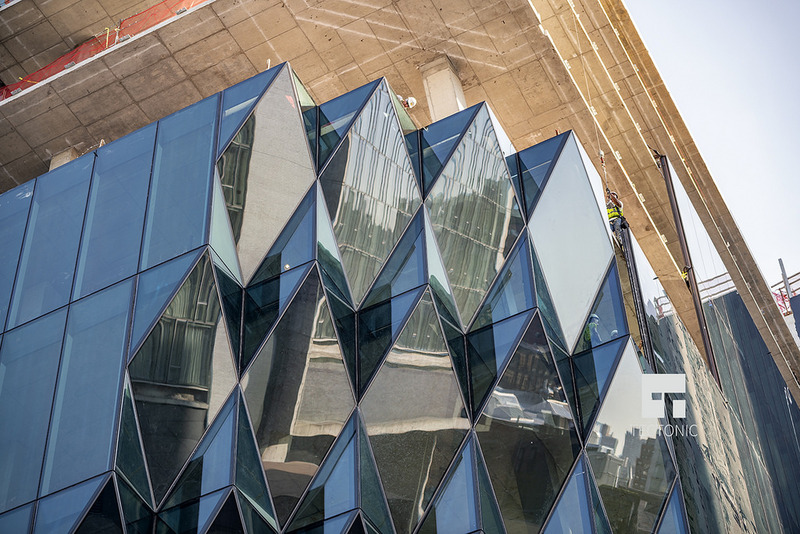 Diamond-shaped glass is seen along the chamfered cut-outs, adding an eye-catching detail that separates those components from the regular glass panels on the east and west facades. 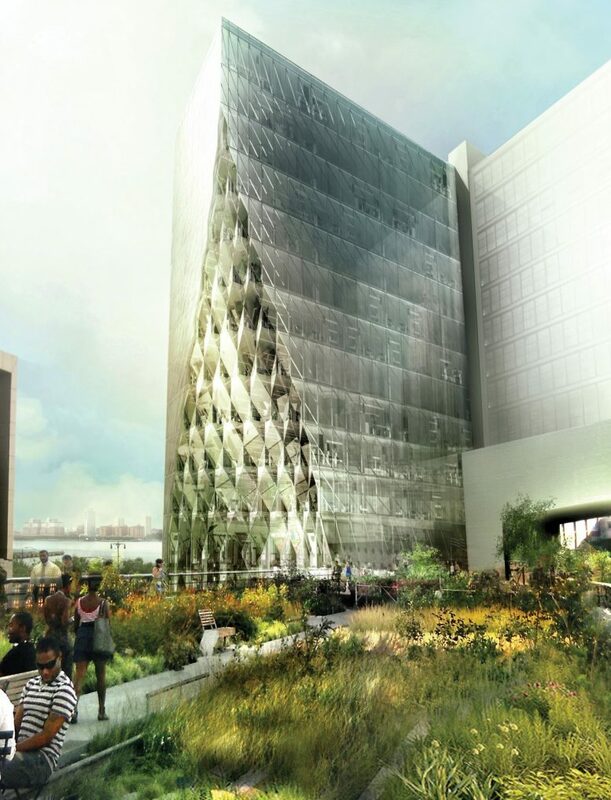 There will be a 10,000 square foot rooftop terrace that overlooks the Hudson River and the rest of the High Line to the north, towards Midtown. 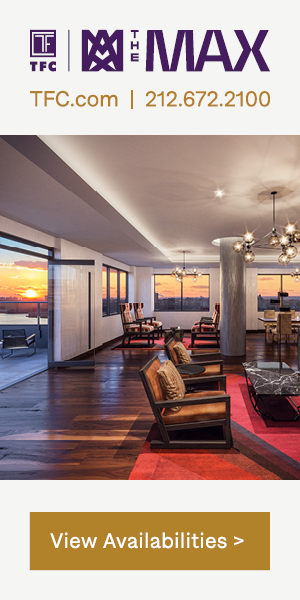 In all, there will be about 20,000 square feet of outdoor space, and eight floors will have their own private exterior spaces. 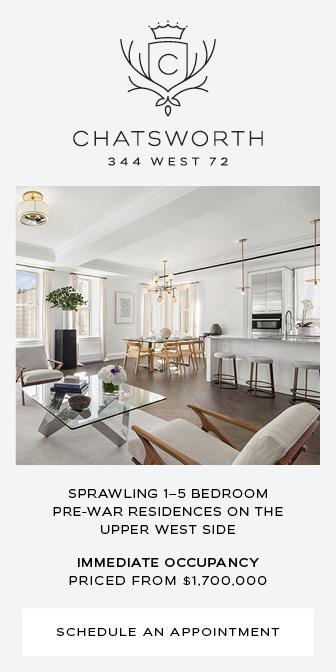 40,000 square feet of retail space will be located on street level along West 13th street, with 17-foot ceiling heights in some parts. 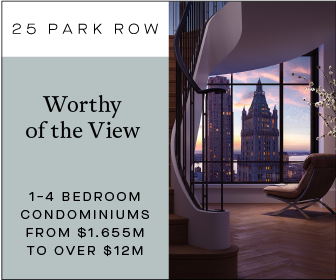 40 Tenth Avenue is surrounded by a number of active projects, including Pier 55, which is well underway and already making huge progress in the Hudson River. 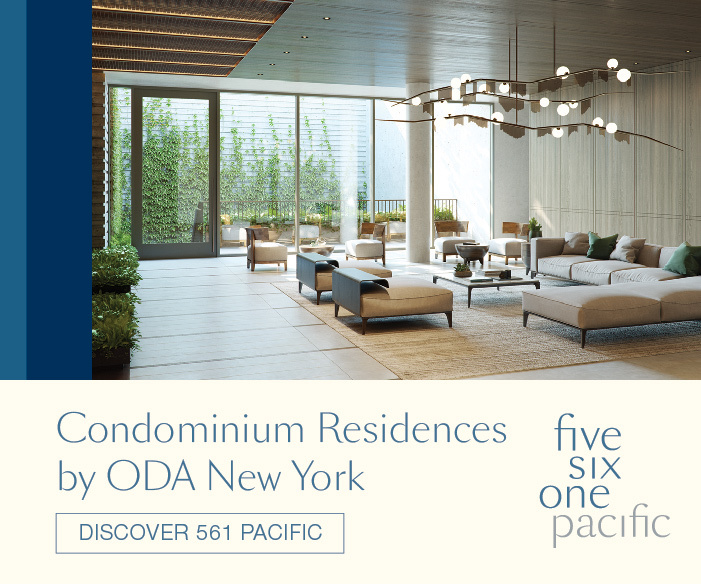 Other sites include The XI just up the High Line at 76 11th Avenue by Bjarke Ingels Group, and 515 West 18th Street, by Thomas Heatherwick Studios. Completion of Studio Gang’s project is expected next year, sometime between early and mid 2019. 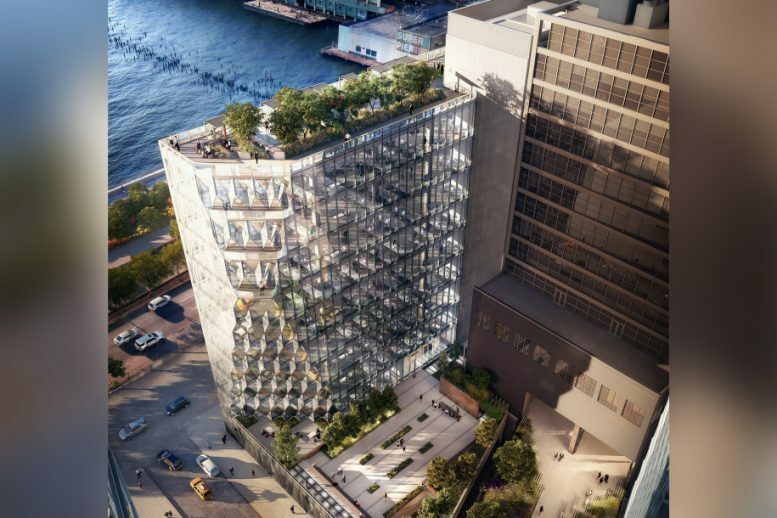 8 Comments on "Studio Gang’s Geometric Solar Carve Tower Begins to Shine at 40 10th Avenue in Chelsea"
Please pardon me for using your space: Do you like orange? Not really. I prefer blue. What is the purpose of this building? Is this an office building, a hotel, a residential building or what? An earlier article describes it as “an expressive office building”. I had to re-read an article from April of this year to be reminded of its function. 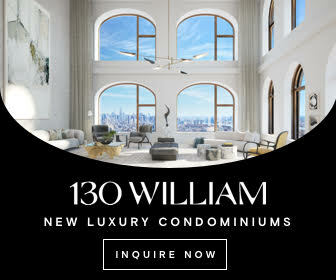 On picture it was shown older 12 story design, matching the rooftop of arched over High Line Office Tower, who hanged their 10 story over High Line, total heigh is 12 story. Studio Gang was later downgrade his new building slightly shorter, slashed 2 stories, and now this building, at 10 story only height, is not matching the rooftop neighboring “arched building”. Creating more real living crystal palace gem on the Highline. What’s quickly separated from any existing before structures. This tower have already making impact on Lower West Side skyline like 10 story IAC Buiding nearby. I think that if it’s gone original as on drawing above at 12 story rooftop, the unique design would be lost in masses of other structures. Overall Studio Gang, is became famous after 84 story Aqua Residential Tower in Chicago, the tallest Residential Skyscraper designed by woman. Rooftop view from this really signature style crystaline building is blocked from the north by the rooftop of neighboring hanging over High Line office tower. But Downtown view and views to SW and SE are not blocked. This building could go higher than neighboring tower, but it’s probably a height restriction at 12-13 floors in this area and if it’s matched rooftop at 12 story he will loose it’s signature mark on the skyline. That’s is probably the main reason why Studio Gang make this building 10 story and carved back 3 top floors to let the sun shines on the High Line.